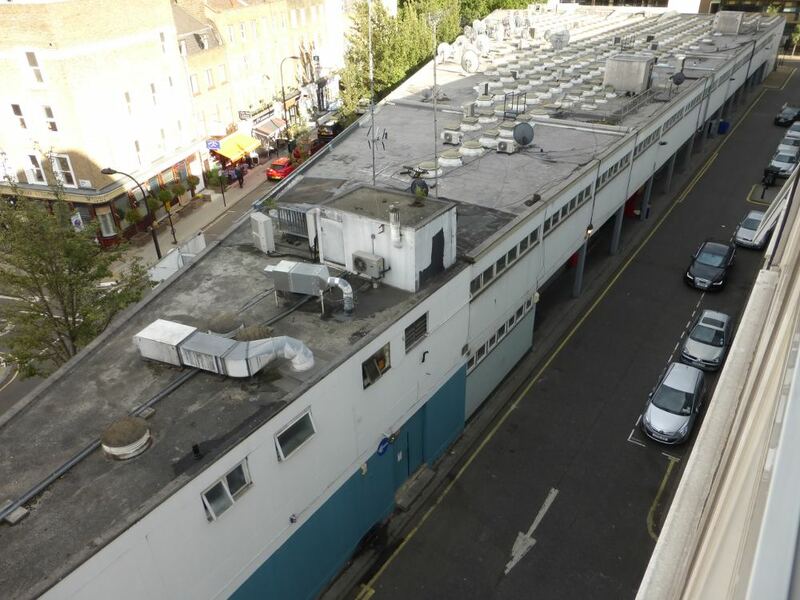 A Greater London Assembly member has directed the Mayor of London to reject plans to redevelop a triangular commercial building in Cleveland Street after making a visit to the site and meeting local people. Denise Julien shows Murad Qureshi how the proposed development will impact on Holcroft Court Residents. 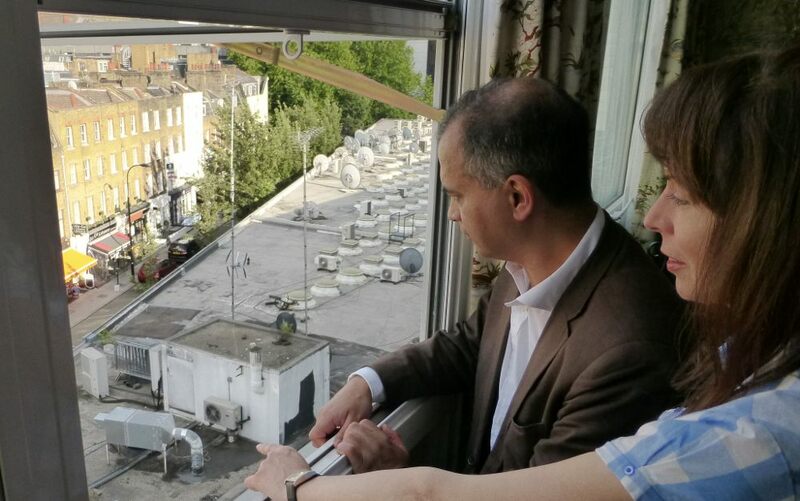 Murad Qureshi a Labour member of the Greater London Assembly (GLA) met residents in July to listen to their concerns about plans for a major property redevelopment only eight metres away from homes at the Holcroft Court Housing estate in Fitzrovia. Earlier this year Westminster council — despite fierce opposition from local residents — approved plans for 105 flats, a petrol filling station and commercial premises, in a controversial deal struck with Soho Data Holdings and Dukelease Properties to redevelop 87-125 Cleveland Street, a site owned by the council. Although 15 of the flats will be for intermediate rent there would be no social housing provided. Qureshi has now written to Boris Johnson before a Stage II decision on the plans is taken. In the letter seen by Fitzrovia News Qureshi calls on the Mayor to refuse the plans because the building will have a negative impact on the quality of life for neighbouring residents. “I visited the site earlier this month and saw first-hand the unacceptable consequences that allowing a ten-storey building will have on the amenity of Holcroft Court residents,” he writes. View of Clipstone Mews (right) and Cleveland Street (left) from top floor of Holcroft Court. The low-rise triangle building would be demolished and a new building consisting of three tower bloacks would be built only eight metres from residents windows. As the proposed development along Cleveland Street is on the border with Camden he says the Mayor must give strong weight to the opposition from Camden Council because of the impact on its residents, listed buildings, and the Fitzroy Square conservation area. “It is therefore imperative that you use your strategic powers to ensure that development in one borough does not have an unnecessarily detrimental impact on another,” he writes. The London-wide GLA member also criticised the way the planning application has been handled by Westminster council and says the development has been “dogged by controversy since first proposed” due to technical aspects of the planning application with regard to daylight impact and accuracy of the plans submitted. “For the sake of clarity it would be helpful for the GLA to validate the drawings and supporting documentation,” he says. Denise Julien a resident leaseholder of Holcroft Court thanked the GLA member for listening to residents concerns and taking time to see the site from their windows. “Having new flats only eight metres from my window will affect my daylight and privacy. I have this small studio flat that I saved hard for and both my bedroom and living space face the new building. Putting a petrol filling station next to our homes will create pollution from noise and exhaust fumes from all the extra traffic in this narrow street”. Boris Johnson is due to make a decision on Thursday 6 August 2015.